Finding the right kayaking water shoe will depend on a few different things. What you wear when kayaking is important and can depend on the paddling environment and the likelihood that you may be taking an unexpected swim. Kayaking water shoes are designed to get wet, but still provide you with enough support and comfort to enjoy your favorite activity. Below we’ll give you tips on what to look for and recommend some of our top kayaking water shoes picks. Quick answer: What are the best water shoes for kayaking in 2019? Material: The material in these shoes is usually a neoprene rubber that is the same material that is used for wet suits. It is designed to be sturdy and keep warmth trapped inside the shoe. Some kayaking shoes will also blend this material with titanium to give more protection and durability. The sole of kayaking shoes should be designed so that you can walk on a rocky shore or even broken glass without getting an injury. While closed toe shoes may be best for kayaking, you can still use open toed shoes. Just be mindful of open toed shoes so you don’t get caught on something and have an accident. Materials that are easy to clean and provide odor control are also helpful in ensuring that you can wear the shoe for a while. Weight: The weight of the shoe should be lightweight so you aren’t weighed down with water, making it harder to get in the kayak. The right kayak shoes will almost feel like they are a part of the body and you may not even notice you are wearing them. Style: There are different styles of kayak shoes. While some are designed as sandals, others are designed more like a tennis shoe. There are also boots available. If you are planning on exploring far from your kayak, or if you know the area that you are exploring is going to have smooth ground, then you can likely get away with any style of shoe. Season: Think about the season and the temperature of the water when choosing your shoe. You want to make sure that your feet and legs stay warm and also dry quickly. Many people will buy shoes without thinking about the water temperature for the season they are going to kayak in. Hypothermia can happen quickly in the water and if the feet are cold, it can cause serious problems while kayaking. For winter, boots and shoes that can cover your feet and ankle work well. For the summer, you don’t want your feet to be too hot and you want a shoe that will breathe much easier. Terrain: Just like you want to consider the season, you should also consider the terrain. If you are going to be walking over terrain with jagged rocks, you want a shoe with a thicker sole that can take the edge off. If you are in muddy terrain, you want a shoe that can dry quickly and can also drain well, so you aren’t stuck with a lot of mud in the shoe. For smoother surfaces, you still want to choose a good tread so you aren’t slipping. Size: Sizing is personal, but it is something you should pay attention to when finding the right shoe. You don’t want shoes that are going to be cutting off the circulation to your feet when they get wet. Some kayaking shoes can create suction when the water is absorbed. This can cause blisters and irritation if the shoes are too tight or too loose. You also want shoes that are going to be stable as you are moving around in the water and you don’t want them to feel like they are coming off when you lift your foot. The feel will be different when they are dry and when they are wet. Kayaking shoes are usually not like regular tennis shoes when sizing. Finding the right size can also depend on the gender. Female feet are narrower than male feet and you may want to find a shoe that is catered to individual needs. Kayaking shoes will offer your feet the comfort and stability you need. They will also dry quickly to allow you to make the trip back home instead of a soggy mess that your tennis shoes could leave you in. 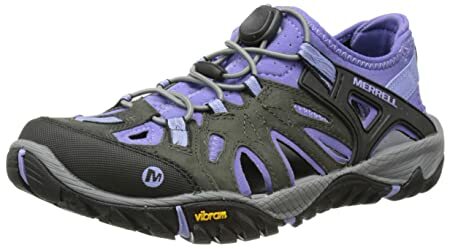 These shoes will provide better traction for slippery or wet rocks and help prevent accidents. Some shoes can be designed to protect your feet from sharp items but still keep your feet dry. There are a number of options to consider when going kayaking. There are three different categories of shoes to allow for personal preference and comfort when out in the water. Traditional shoes will hold a lot of water, so while they could technically get the job done when it comes to kayaking, it can result in what feels like heavy bricks that are tied to your feet. Water shoes are designed to prevent this feeling and feature water resistant materials that will shed water. There is also a built-in system to drain the water that does get in from the inside of the shoe. You may spend the entire day out in the water kayaking and your feet don’t get wet, but the chances of them getting wet are great and you want to be prepared for every situation. A water specific shoe will keep you more comfortable and prevent you from sitting for hours with soaking wet feet. Boots for kayaking can be a good option for those who are going to be getting on and off their kayak throughout the day on the water. Surf boots can feature a rugged sole that is good for gripping slippery rocks and providing some added protection around the toe and mid foot. The added protection allows you to be careful of any rocks and oyster beds. Boots range from a lightweight material to more of a heavy-duty design. If you are going to be going through a lot of debris, then you may want the protection of a heavy-duty boot design. Boots are also a good choice for the cold weather since you will be warmer than a traditional shoe. You can also add warmth through neoprene socks that are designed for water. These types of socks will perform much better than a synthetic or cotton sock, especially when the socks get wet. Sandals are a great choice for kayaking because they are waterproof. They don’t hold any weight when they do get wet and can dry much quicker than other shoe choices. Sandals are also easy to take off, so they are great for a day of recreational paddling because you can quickly remove them to enjoy a nice swim. 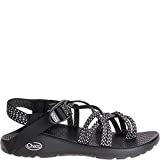 There are sandals that feature a more rugged sole to help provide some additional protection if you are going to be doing some hiking after a day of kayaking. Even though these shoes provide some additional protection, they still allow your feet to breathe. The traction allows for less slipping than a traditional flip-flop. These can be a good choice for hot days to be more comfortable. If you’re shopping for a new pair of water shoes before you take the kayak out this year, then we highly recommend any of the models listed below. We’ve found some great options for both men and women. This brand of shoe features the LUVSEAT foot bed, which gives contoured arch support. The American Podiatric Medical Association certifies it. The Durable PU midsole is made from polyurethane compounds. Other foam will compress with wear or break down quicker. This material allows for durable products that will last longer on your feet, instead of just ending up in a landfill. The ChacoGrip is a non-marking rubber compound that is developed for performance and to work in extreme conditions. It is optimized for traction, even during wet conditions. The adjustable straps allow for quicker drying polyester that will wrap around the feet and through the midsole to ensure a customized and comfortable fit. There are adjustable and durable high tensile webbing heel risers, as well as antimicrobial application for better odor control. Shoes come with different colors and different designs for the straps for a customized look. They are great for kayaking and are also built for Class 5 whitewater adventures, so they can be used for every adventure. 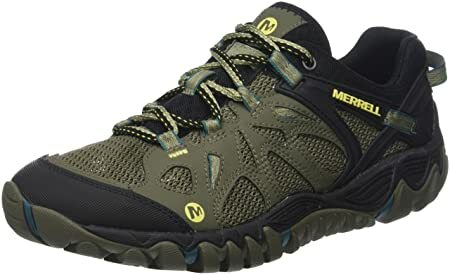 This men’s shoe is a lace up hiking shoe that features branding details, along with durable synthetic materials and breathable mesh, making it perfect for water adventures as well as hiking. There is a cushioned and protective UniFly midsole for comfort. It also allows you to keep closer to the trail while still protecting you from the harsh terrain. The omni fit lacing system allows for a more customized and comfortable fit. The breathable mesh lining comes with odor preventing M Select FRESH technologies. This technology keeps your feet ventilated so they have a natural feel. There are three different colors available. The shoes are vegan for the eco-conscious wearer. The molded TPU heel counter adds more stability for uneven terrain. The foot bed of this shoe is designed to provide a contoured arch support and be comfortable for long hours of whatever activity you enjoy. The polyurethane compounds the sandal is made from ensure that it won’t break down with long wear. This ensures that the shoe will last and won’t have to be replaced as easily. The outsole is made from a non-marking rubber compound that was developed for performance. It allows for a better grip in extreme conditions and even when wet, making it the perfect choice for a day out in a kayak. The custom adjustable straps are quick drying and will comfortably wrap around the foot and the midsole and allow for a customized fit. The whole shoe is designed for all day comfort, no matter what activity you are doing. There are different colors available for the straps and the sole, in order to let your personality shine through. The shoe is available in a medium width and a wide width. The company has been making footwear since 1989 and has been making products that are designed to outlast the competition. Their focus in on footwear that can repaired, instead of just ending up in a landfill. All their footwear features a biocentric foot bed that has received the APMA Seal of Acceptance. They support the people and the planet and will donate three percent of after-tax profits to organizations that are dedicated to caring for the planet and people. This shoe features a synthetic sole with a heel that measures approximately one inch. These shoes can shed water fast and have a hiking design that will handle both dry and wet terrain comfortably. The waxy leather upper and soft Lrycra neoprene stretch colors are great for any water activity. The EVA midsoles will offer a soft cushion and support when your feet need it the most. The rubber outsole gives softer reliable traction on every type of surface. The bungee laces allow for a more comfortable and customized fit. These sandals feature a rubber sole with a bungee lace capture system. The elastic cording bungee laces give the sandal a more secure fit. This lacing system also allows for easy on and off comfort. There is a hydrophobic mesh lining with a non-marking rubber outsole. The compression molded EVA midsole provides more comfort than other styles. The feminine style of the shoe was designed with the female foot in mind. The concept has a patented toe protection to provide some stability and safety. The foot bed design is an internal support mechanism that is engineered to help provide better arch support and cradle the natural contours of the foot, in order to ensure comfort for all day wear. The shoe comes equipped with Cleansport NXT for natural odor control. The sole features a multi directional lug pattern that will allow for better traction on any terrain, including when the shoe is wet. All sandals by this brand are machine washable. All you have to do is use a small amount of detergent and wash on a gentle cycle. Air dry in order to preserve the shape of the shoe. For a quick comparison, check out the table below of our top picks right now.